Active macrophage. Immunofluorescent light micrograph of an active macrophage white blood cell producing the enzyme inducible nitric oxide synthetase (iNOS, red). 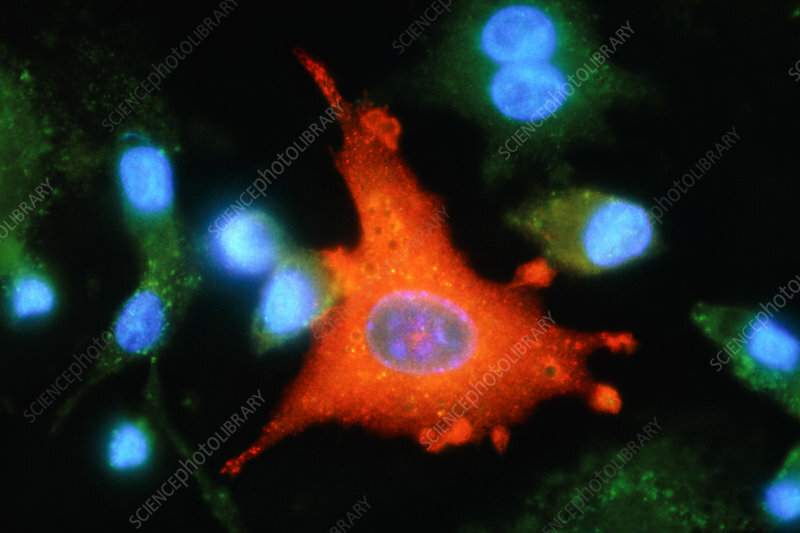 The cytoplasm of the other as yet unactivated macrophages is dark green, while cell nuclei are blue. The enzyme iNOS converts the amino acid arginine into nitric oxide, an important signalling molecule that in this case is regulating and mediating the immune system. The macrophage has been activated by exposure to a mock bacterial infection. Macrophages help to kill invading organisms. Magnification: x200 at 5x7cm size.